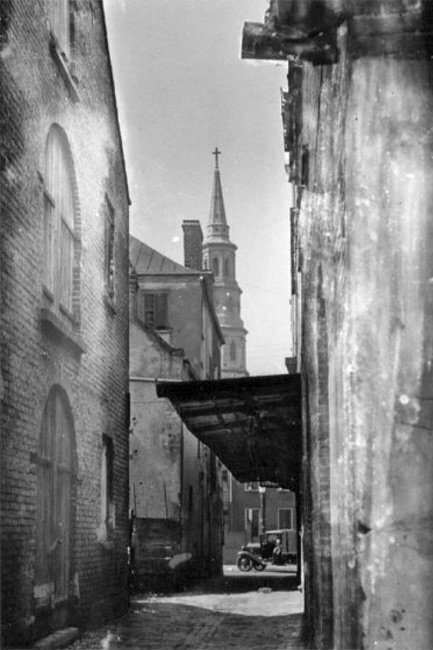 One of the oldest streets in Charleston, Lodge Alley lies between East Bay and State streets was used as a passage from nearby residences to the harbor’s warehouses and wharves. During the early-to-mid eighteenth century, most of the buildings in this part of town were owned by French Huguenots, giving the district the name French Quarter. Lodge Alley dates to at least 1739, when it appeared on a plat as Simmons Alley. When a Masonic lodge was built along the 10-foot-wide thruway in 1773, the street name became known as Lodge Alley; incidentally, the lodge, officially named the Marine Lodge of Freemasons, was one of the earliest Masonic lodges in the country. It was in this lodge where the “Liberty Boys” met in 1774 to stage a parade of effigies of the Pope, the Devil, and Governor Thomas Hutchinson of Massachusetts in protest of the British government. The passage is referred to as an “alley” because it is a minor street with no walkway. As in many similar alleys of Europe, the narrow passage was built with a drain running along the center. It is paved with “Belgian block,” or brick-shaped blocks of granite. 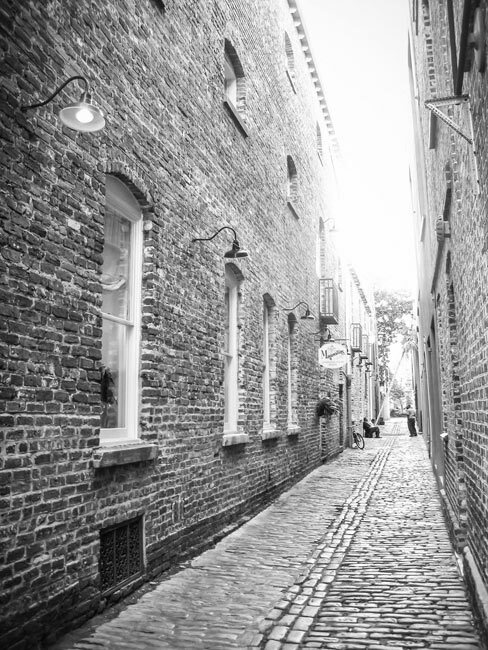 Lodge Alley exists within the former walled area of Charleston; in Charleston’s early decades, from the late seventeenth century through the 1730s, a portion of the city was fortified with a wall. The wall was torn down in the late 1730s to make room for more development, with the exception of the walls on the harbor side. By the end of the eighteenth century, none of Charleston’s walls remained. Today Lodge Alley stands in the commercial district of East Bay Street. (Lodge Alley) The French Quarter District is located in an area of the old walled city of Charleston where the French Huguenots once had warehouses and dwellings. Early Charleston merchants used the warehouses for their ships at the docks off East Bay Street. 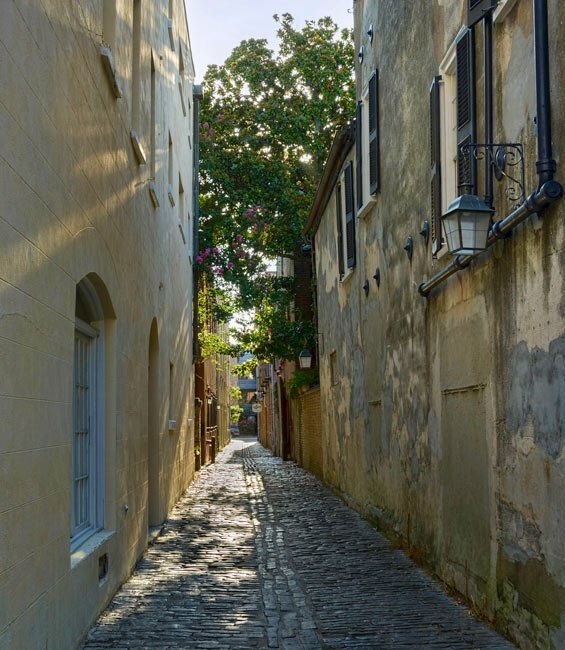 One of the oldest streets in Charleston, Lodge Alley is a visual example of Charleston’s Old World ties, exemplifying the definition of an ally as a city street but not a main thoroughfare. Lodge Alley still has a seaport look. Brick warehouses of Flemish and American bond bound each side of the ten-foot wide passage. The alley is paved in Belgian blocks – a local term for a brick shaped block of granite. The ten-foot width of Lodge Alley compares favorably with many of Charleston’s principal streets of the early 18th century, now impossibly narrow by modern standards. Lodge Alley also illustrates Charleston’s distinction as one of the cradles of Freemasonry in America. The alley takes its name from the Masonic Lodge situated on its course about midway from East Bay Street. This site was acquired as early as 1773, making it one of the oldest Masonic Lodges in the country. As part of the old walled city of Charleston, Lodge Alley and the French Quarter District are in an area which reflects not only three centuries of South Carolina history, but also three centuries important to the course of American history.